A ReMARKable Kitchen Store, Kitchen Remodeling, Bathroom Remodeling, Kitchen Design, and more in Pittsburgh, PA and surrounding communities. A great kitchen design is a blend of functionality and beauty, crafted to meet your needs, lifestyle, and sensibility. We Know How Kitchens Should Work! Welcome to the Pittsburgh area's full-service store for kitchen design, kitchen remodeling, bathroom remodeling, and more. At A ReMARKable Kitchen Store, we feature the custom craftsmanship of Levant Woodcraft products, the fine cabinetry of HAAS Cabinet Co., Inc., and countertops of superior strength and durability, from granite and quartz to the finest quality laminates. Why choose A ReMARKable Kitchen Store for your kitchen design or bathroom remodeling project? Kitchen Design. Work with an experienced chef to create a stunning design of both beauty and remarkable functionality. We even help you visualize your design through computer aided graphics before the work begins. Two Year Warranty. 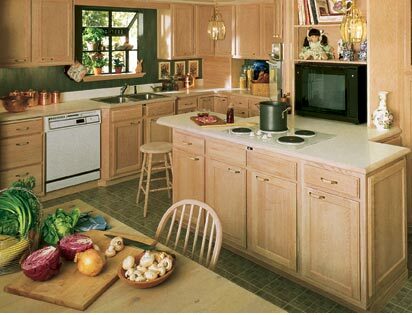 Where most companies offer a one year warranty, A ReMARKable Kitchen Store provides a full two year warranty on installation, which includes labor. Remarkable Cabinets, including stock and semi-custom kitchen cabinet designs from HAAS Cabinet Co., Inc. and premium custom cabinetry from Levant Woodcraft. Kitchen Remodeling. Complete remodeling services, including walls, floors, tiles, electrical, plumbing, and wallpapering. Everything under a single contract for your convenience. Countertops. Granite kitchen countertops are perfect for designer kitchens, yet affordable choices in quartz, Corian, soapstone, and quality laminates can add remarkable beauty to your kitchen design. Visit our Countertops page for more information. Everything You Need. At A ReMARKable Kitchen Store our Featured Products include everything you need to customize your kitchen and bath home remodeling project. Bathroom Remodeling, from glass block showers and Jacuzzis to heated floors, heated towel racks, and more. Our showroom is a great place to inspire your imagination with the comfort and convenience a new kitchen or bath from A ReMARKable Kitchen Store can add to your lifestyle. Meet our kitchen design experts and learn how our Kitchen Design Process allows you to proceed with confidence. We appreciate your visit to A ReMARKable Kitchen Store's website. It will be a privilege to serve you and your family, so don't hesitate to contact us to learn more about our services. At A ReMARKable Kitchen Store, designs of extraordinary beauty and functionality are within your reach. Each elegant kitchen design is created by an experienced chef, who brings years of culinary understanding to the composition of a perfect cooking workspace. Receiving the best value for your investment. The assurance of a fair quote. Knowing the job will be completed efficiently and cleanly. Working with a team you can count on after the sale, ready to fine tune every facet of the project until you are satisfied. With every kitchen remodeling and bathroom remodeling project, A ReMARKable Kitchen Store stresses design, value, workmanship, and service.